I don’t have the best knife technique ever but sometimes I like to pretend that I have mad chopping skills. I especially love breaking down cauliflower. Once you get the core out you can just get into the zone cutting up the florets into tiny, bite-sized pieces. I love how cauliflower are fractal – no matter how small you cut the florets, you can still tell they’re cauliflower! Cauliflower is one of those versatile vegetables that you can pretty much do anything to. Like my ultimate favourite vegetable, potatoes, they taste great boiled, steamed, baked, stir-fried, deep-fried and best of all, roasted. 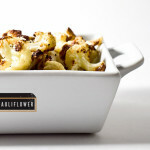 Roasting at high heat gives cauliflower a sweet, almost caramelized flavour. The florets end up soft, but not mushy. 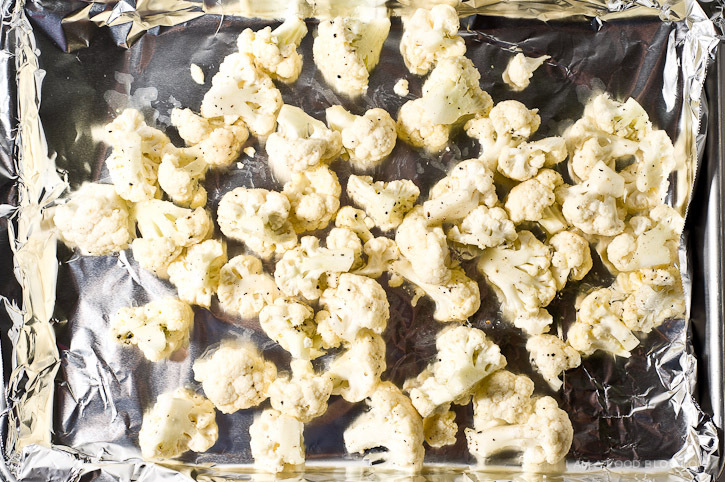 Roasted cauliflower is like cauliflower candy, no joke. I’m pretty sure I can eat a whole head myself. Cauliflower were on sale recently so I went ahead and bought two. Excessive? Maybe. But for someone who falls into food obsessions, two heads of cauliflower is nothing. We’ve been eating roasted cauliflower for three days straight and counting and I’m loving it! 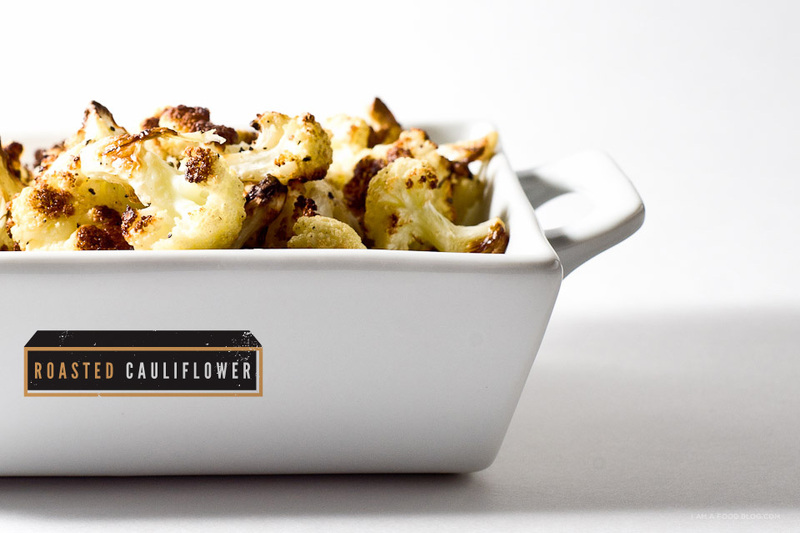 Do yourself a favour and jump on the roasted cauliflower train – it’s a very tasty ride! i am caramelized, i am roasted: i am roasted cauliflower! Preheat the oven to 450°F. 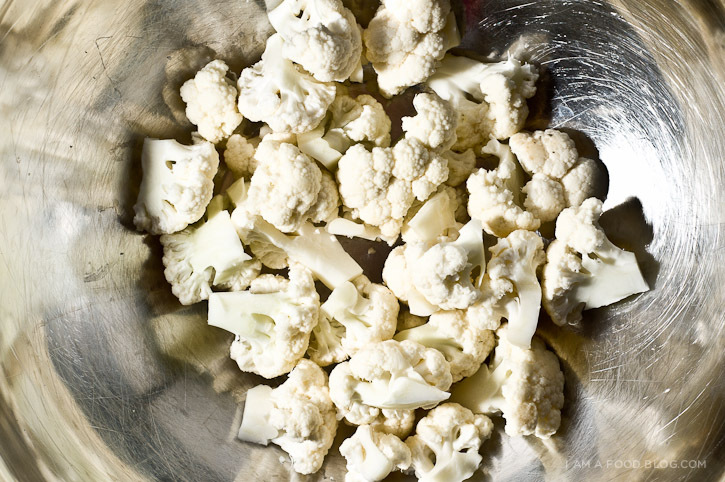 Toss the cauliflower in a large bowl with the olive oil, salt and pepper. Line a large baking pan with tinfoil for easy clean up. Spread the cauliflower out on the pan and roast, stirring occasionally if needed, until tender and golden brown about 25-35 minutes, depending on the size of your florets. I love roasted cauliflower! My fiance and I cook it a similar way, only we add lemon juice and cheddar cheese on top before we put it in the oven. It’s amazing! I love this! It’s simple, healthy and tasty – win, win, win! Roasted cauliflower is the best–certainly a far cry from the soggy boiled cauliflower of my youth. I think my favorite way to eat it is as a garnish for a thick tomatoy or peanutty soup or stew. I love roasted cauliflower.I’m always interested to read other recipe’s to see if anyone has any clever spins, but olive oil with s&p is the simplest and the best. i’m all for the browner the better! i believe this is the best way to eat cauliflower. great work! I’m going o try this tonight, I hope my man likes it! How gorgeous is that cauliflower! do you need to boil it? I always feel like I’ve got mad knife skills when I’m breaking down a cauliflower, too! I’m probably doing it all wrong. Roasted cauliflower is so addictively good! I could easy snack on a whole head of it after coming out of the oven! Still one of the best recipes I’ve found in a long time, thanks. A good trick – to really get a nice sear on the florets (and for that matter, on any roasted veggie) – is to stick the roasting pan in the oven (sans foil) while it heats. Then toss the florets on teh pan and put it in the oven. So good! Mmmmmm… I like cauliflower especially with the cheese, then is the most delicious… Very good! Add a little thyme in with the salt and pepper. From tasty to gourmet in seconds. I like to make cauliflower soup by roasting on the stovetop in a large pot with an onion and pat of butter until soft. Then add a box of chicken stock. Simmer for 15 minutes then blend. One of the best simple foods ever. Now this is an add on that I will try with the roasted cauliflower , sounds delicious! The stem or the core of the cauliflower is just as good! I just take a pairing knife and remove the fibrous outer layer, then chop up into little pieces and toss along with the florets. It’s delicious! perfect recipe- but lemon zest the minute it comes out of the oven takes it up that necessary notch. I added roasted garlic and turned the roasted cauliflower into faux mashed potatoes. Mmm mmm mmm! It was so delicious. I added some broccoli and garlic even better. Recipe so simple yet delicious.